The ears should be of moderate size, triangular in shape, and set high up on the side of the skull. The base of the ear leather should originate slightly above eye level. There should be some lift at the base to allow for air circulation, while breaking over enough to offer protection from foreign objects. The correct ear leather size should reach the inside corner of the nearest eye. What does this look like? Prick ears are pretty easy to discern. They will stand completely erect like those of a German Shepherd Dog. Hound ears are all too common though, as some folks seem to have a hard time figuring out what that means. I see a lot of hound ears in conformation (show) lines. Sometimes they are just lower set, bigger ears but some are very, very houndy. Hound ears come off the head lower, closer to the line from the outside corner of the eye, and will hang down to the jawline or lower. This not only detracts from breed "type" but also predisposes the dog to more ear infections, since no air can get in the canal. Prick ears are less prone to such things but also detract from breed type. 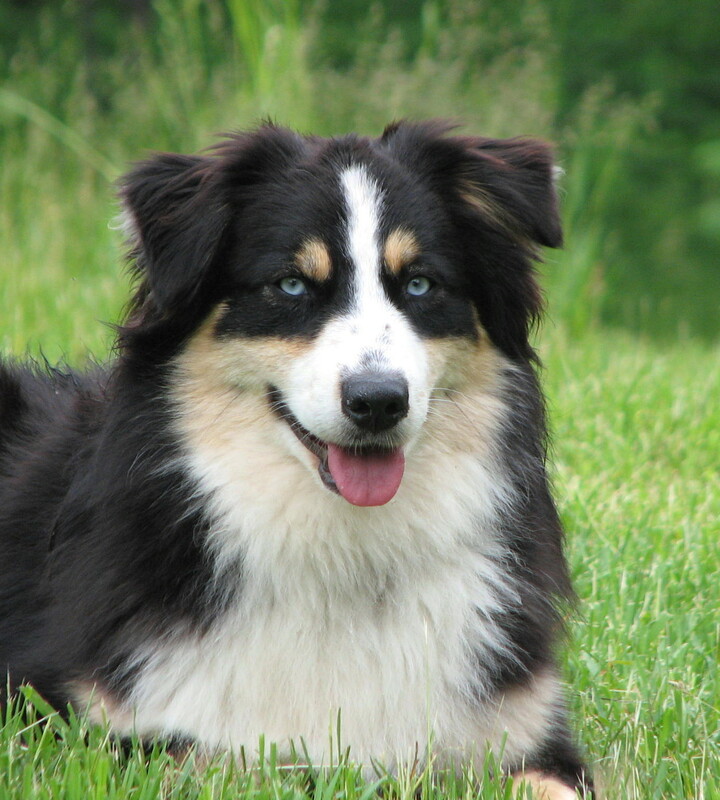 Some say dirt and debris can get in the ear, but I am a little skeptical as other herding breeds have erect ears with no detriment to the dog. I will add a few photos of various ear sets to help illustrate. I hope to add more photos of the more extreme ends of the variation (prick and hound ears.) The picture I have here now of an Aussie with "erect" ears is actually one with a normal earset, but she's running. It does show what it looks like when their ears are full erect. The other blue merle on the left below has ears that are sort of houndy, but not at the extreme as they don't reach the jawline. They are loser set than some and bigger and heavier though. It is common to see this ear type in show lines, though not all have ears like this. To glue or not to glue, that is the question! There are various opinions on the topic of gluing the ears of an Aussie. Since there are a couple ear sets that are acceptable for conformation showing, and some that are faulted, some people raising a show potential puppy will glue them, especially as they go through the months of teething. At that age, the ears may do a lot of funky things, and sometimes get stuck that way. Think of your mom saying "if you keep making those faces it will get stuck that way!" Ha ha! Seriously, if the dog is going to be a pet, and the owner doesn't care, there is no reason to bother. If the owner is more interested in having "standard" ears, you can use a little "Tear Mender" or other latex glue product to help keep them in the right position. Done correctly it's not harmful to the dog, and the product isn't hard to get out of the coat. Gluing may be something you do one or two times, or off and on for several months. 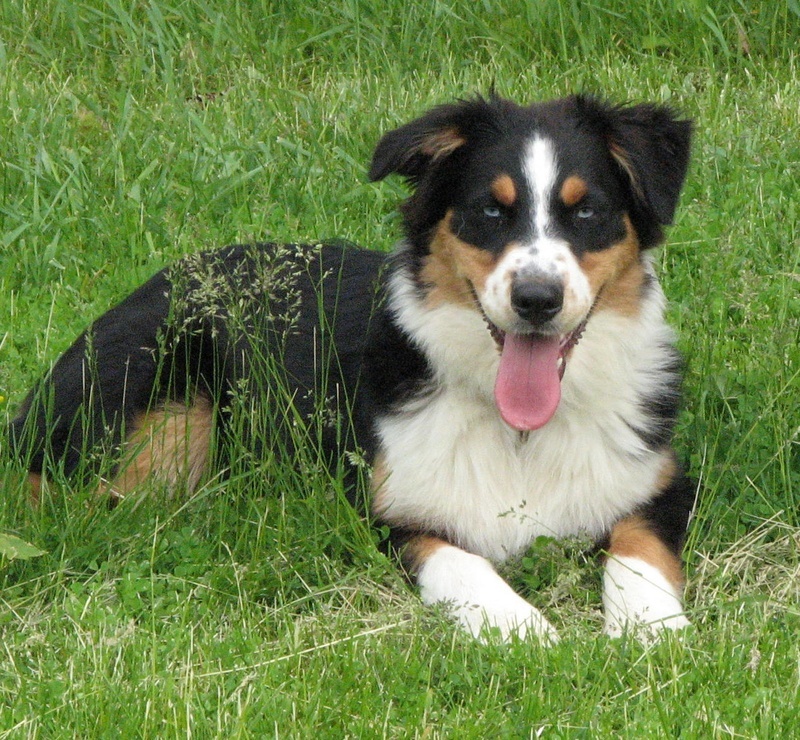 There are various opinions on whether one should glue ears however, especially in a dog that may be bred. One side says if the ears are glued, you will never know what they have genetically. I agree and understand that point of view. The other side says that if the dog is superior in other ways, why not glue ears so it can be more competitive in the show ring. 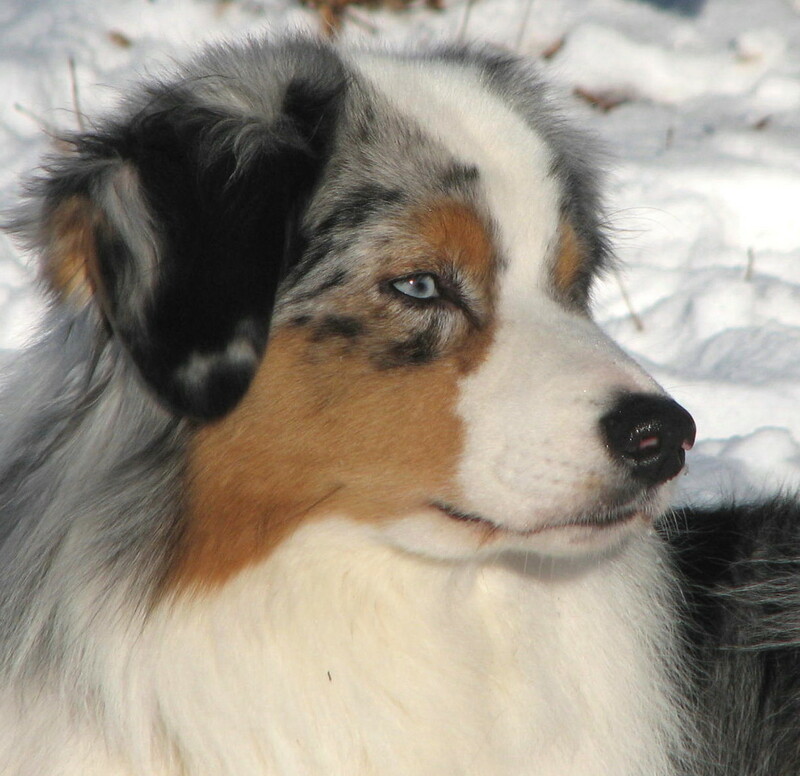 A third group may say they just want their dogs to look like the typical Aussie. I can see all points of view and will let people make up their own minds on the topic. I also decided to put up a few photos (coming soon) of the process, for those who may want to do it. I would recommend starting whenever the ears start to go funny. That could be as soon as 10 or 12 weeks of age, or later. I am adding a photo of my dog Lucy, who shows one "button ear" and one "rose ear" in this photo. Hers go back and forth all the time. The button ear is on her right side (left side of photo) and the other ear folds differently. I will also include a photo of a pup named Passion, who has the same thing going on with more noticeable differences. It shows what ears may turn out like if left natural or glued. 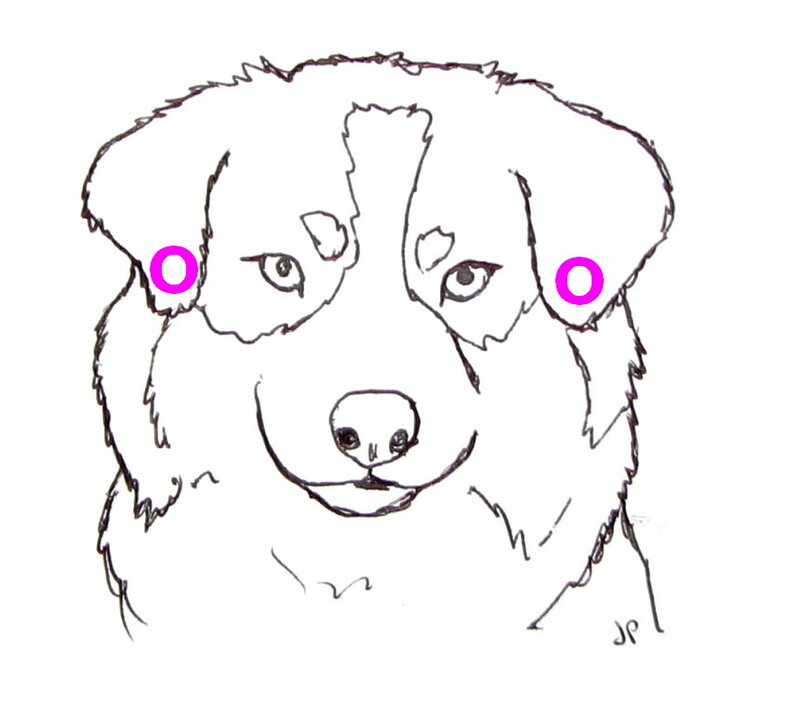 Both ears are correct by the breed standard, but many find the button ears which fold forward to be more appealing than the rose ears which may stick out to the side. On Passion her left ear (right side of photo) is a button ear, and her right one is a rose ear. This picture above is from a person who bought this pup. They saw the one ear start to stand, so glued it for a couple days. The picture on the left is before that, and the center is right after, and the far right is after a couple days post-gluing. It shows how puppies' ears can do all sorts of odd things during the teething process. Both this pup's parents have natural ears which never came close to standing at this age. I thought I'd just do a quick drawing showing about where the ears should be. It may vary a little depending on the size of the dog's ears. If you are going to glue, you put the dab of glue on the underside, about where I put the pink "O", and stick them to the sides of the face about how they look in this picture. I wanted to talk a little about dew claws. These are the smaller claws/toes on the front legs of a dog, and less commonly, the hind legs. Many breeders remove them shortly after birth. 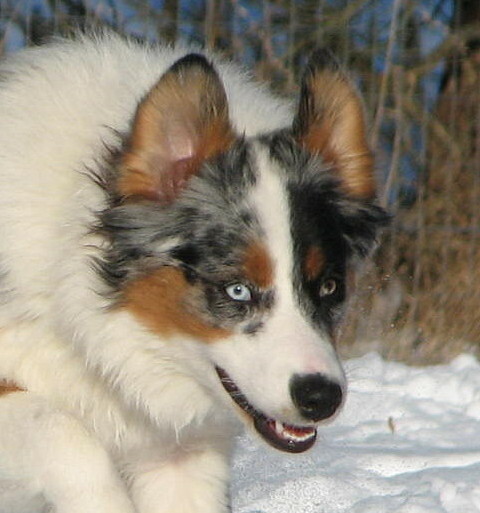 Some breeders, especially those breeding for performance activities such as agility, leave them on the front legs, but everyone would remove them from the rear, at least in this breed. I have also considered the fact all wild canids have them. I have heard the argument that dogs will rip them off while running or working, but given the fact wild canids do fine with them, and in all my many years of owning many dogs and knowing countless others, I have yet to see an injury with one. I am not saying it doesn't happen, but that in my experience it's so infrequent, and to me it's not worth the cost to the dog to cut off something that "might" be injured. It takes an extra few seconds to trim when you do the dog's nails, but it's not a big deal to include in the dog's normal grooming routine. They are almost a "thumb" to the dog, and when they are removed, they weaken the front leg of the dog, as tendons are cut. Also, when the dog runs at full speed or makes quick turns, the dew claws add stability as at that point they make contact with the ground. I have also seen many dog or wolf use them to hold things such a bones as they chew, and to use them to groom their faces, scratching an itch, or like a toothpick to get something out of their teeth. After a lot of thought and research, I have decided to leave them on my pups, unless otherwise requested.